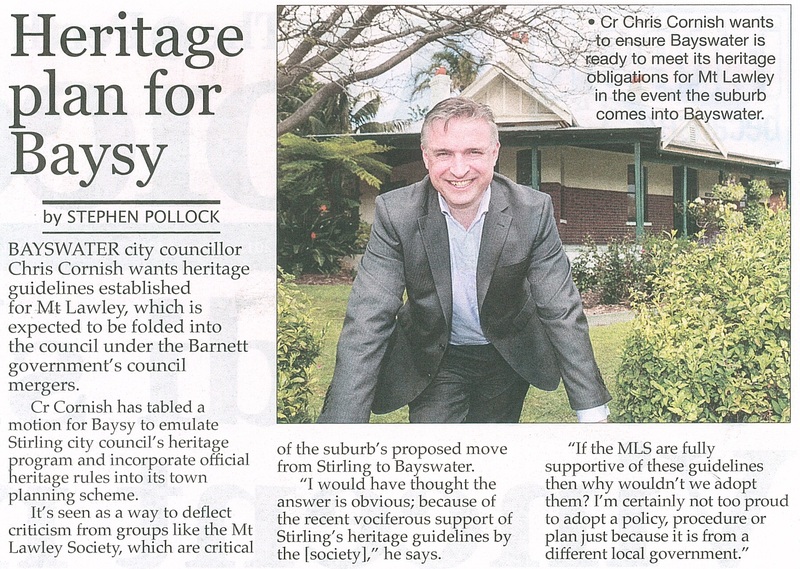 I want to make things better for the residents and ratepayers I represent. To that end, I have an impeccable attendance record at council meetings and frequently contribute to the debate, especially on matters of sustainable financial practices, corporate governance and perhaps most importantly pushing for greater community consultation and involvement. 11/12/2018 – That we request WALGA to conduct a full review of their governance model, including zones, zone representation and State Council representation. 11/12/2018 – That the City develops a robust, transparent and fair whistleblowing process to to set a best practice benchmark on how organisations deal with whistleblowing and should refer to the induction process, the exit interview and everything in between. 27/3/2018 – I moved at Council that we reduce the “Elected Members Conference, Seminars Attendance and Authorised Travel Policy” from $15,000 every 2 years, to $15,000 every 4 years. Also that any claims made under this allowance is made publicly available on the City’s website. 12/12/2017 – “That Council request the City to prepare a report on the possibility of converting the grass land between Memorial Drive and the Eric Singleton Bird Sanctuary into a forest. The report should include the costs (including cost savings) and feasibility, as well as provide ideas for community consultation and community involvement. The report should be delivered in time for 2018-19 budget deliberations.” Let’s make an urban forest. 14/11/2017 – “That the City of Bayswater accepts the offer to be involved in the Citizen Science Project: Scientists working with Communities to improve urban microclimate.” I received a letter from RMIT University and the University of New South Wales inviting the City’s participation in a study on, among other things, the Urban Heat Island effect. We are the only Local Government in WA participating. 28/02/2017 – “That the City of Bayswater publishes its planning data either in a machine readable format which is searchable by PlanningAlerts, or develops a ‘web scraper’ in order to present the City’s planning data in a format PlanningAlerts can use”. This would allow registered users to be informed about development applications near them. 25/10/2016 – “That the City implement an ‘employee of the month program’.” The staff are the backbone of the City and it is important they feel valued and are recognised when they go above and beyond. 17/05/2016 – “That the City of Bayswater update the chamber’s conference and audio system and commence recording all council meetings, excluding confidential items. These audio files are to be made publicly accessible via the City’s website. • Electronic voting with results displayed within the chamber.” Allowing residents to hear the council decision making is a fundamental part of democracy. through the Telecommunication Allowance.” We receive an IT allowance of $3,400 p/a and I believe this is more than sufficient to cover any telecommunications and data costs; no need to double up. 02/01/2016 – “That Council: *Amends Policy EO-P04 to exclude all items under the equipment accessories component of the policy. * Any claim made since 17 October 2015 be refunded to the City”. 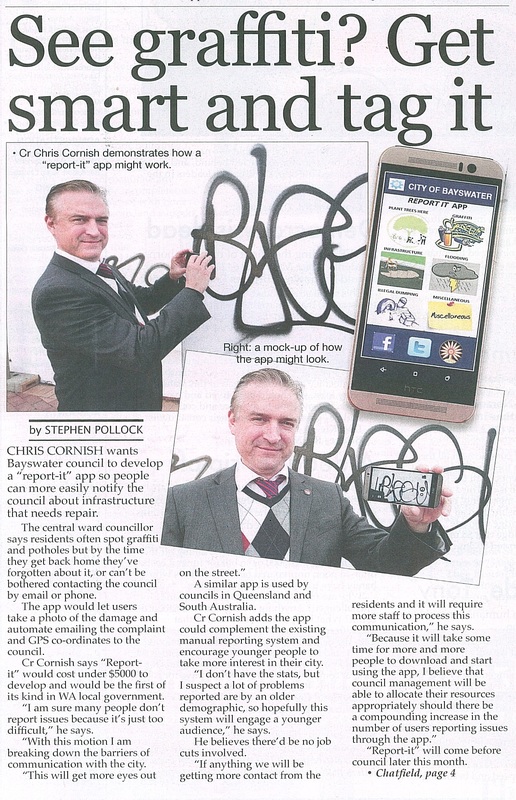 This prevents Councillors from claiming $1,000 p/a for the following: 1. mobile phone and/or tablet, 2. Mobile hands free kit, 3. Filing cabinet, 4. Shredding machine. 13/10/2015 – That the City write to the Premier, leader of the opposition and the Attorney-General informing them of our displeasure with the State Administrative Tribunal and requesting they make an election pledge to review the role of SAT with a view to disbanding it. 22/09/2015 – That the City establishes a 5 year footpath program. I do not consider it acceptable that there are many roads still without footpaths. People with prams, or on gophers, shouldn’t be forced to travel on the roads. 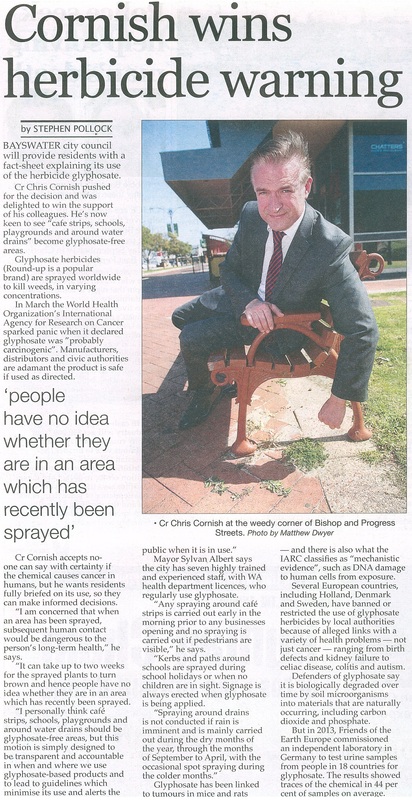 22/09/2015 – That the City of Bayswater produce information sheets and guidelines on the use of glyphosate based products with the objective of better informing the public when they are used, and minimising usage. 23/6/2015 – To develop an interactive mobile application in order to streamline the reporting of local issues. 28/4/2015 – Fly the Aboriginal flag outside the civic centre and display the Aboriginal and Torres Strait Islander flags, along with the Australian flag, inside the council chambers and on the various reception desks. 28/4/2015 – Allow edible gardens to be grown on people’s verges, in local parks where there is spare garden beds and develop a traditional community garden. 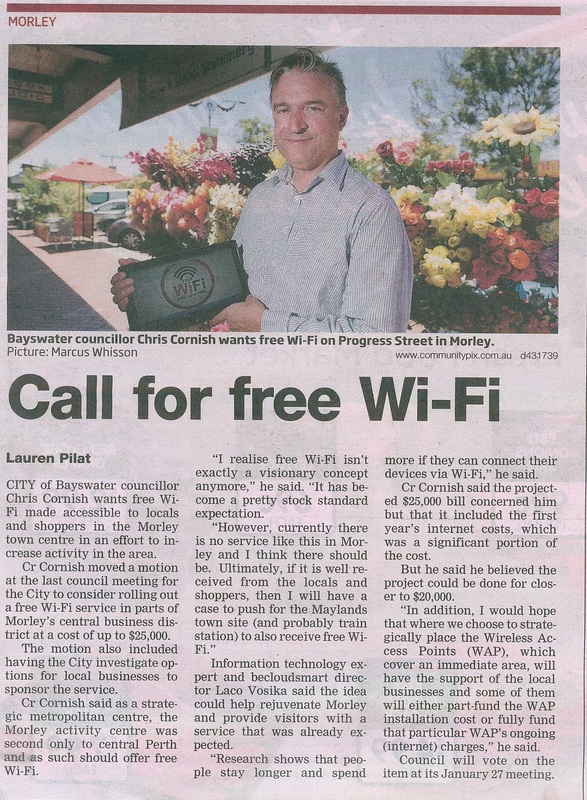 27/1/2015 – Initiate free wi-fi in the Morley town centre. 29/12/2014 – Amend the scheme to Prohibit multiple dwellings in residential areas coded R40 and below. 23/9/2014 – Increase the tree canopy from a lowly 13.2% to 20% by 2025 (you should already be seeing more trees on our major road reserves). 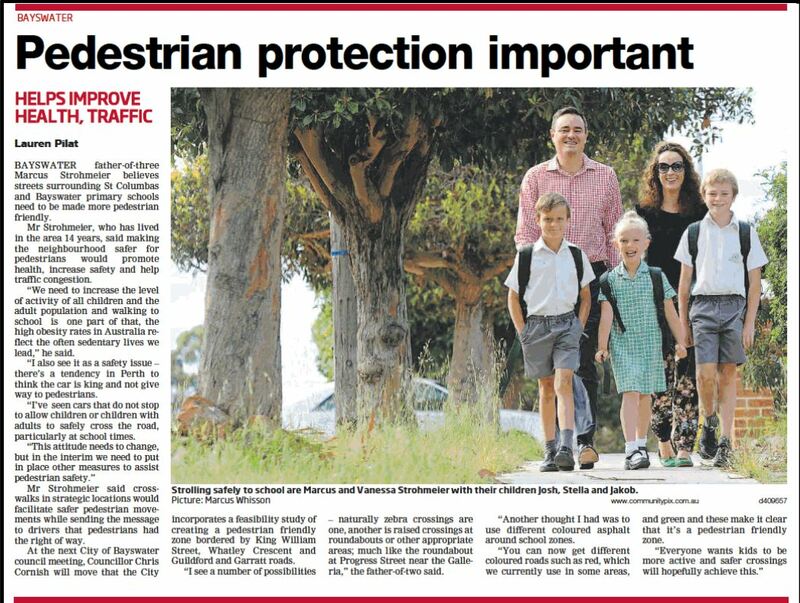 19/11/2013 – Include pedestrian concerns into the Citywide Traffic Management Study. 19/11/2013 – Provide drinking fountain with dog bowl at Houghton Park and other active reserves. 19/11/2013 – Install public toilets in the Bayswater town centre. 15/10/2013 – Create heritage and character protection guidelines for the City. 29/1/2013 – Beautify Russell Street Drainage Basin (next to Bunnings). 26/6/2012 – Audio-Record council meetings and make them available to the public via the City of Bayswater website.